The NEW promotional home renovation loan rate is an attractive 6.95 percent (7.18 percent APR ). As the economy picks up and consumer spending confidence continues to improve, home improvements will be considered en masse in the coming months ahead. The extension of the Government’s Home Renovation Incentive Scheme also provides some welcome tax relief for those planning expenditures on repair, renovation or improvement works this year. The customer focused philosophy at Athlone Credit Union has always been to look at things differently. They understand the difference home improvements can make to your life, increasing comfort and adding space. With that in mind, Athlone Credit Union only propose home improvement loans with realistic terms, which you can pay back in a way that works best for you. They don’t charge administration fees or transaction charges and you can pay back your loan early without penalty, should that become an option. In Athlone Credit Union, you are not a customer, you are a valued member. 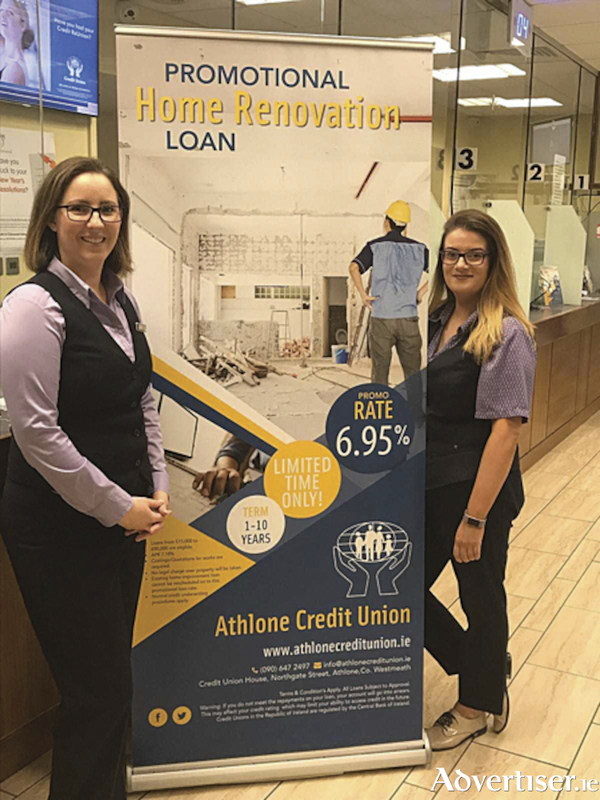 No matter what your promotional home renovation loan is for, Athlone Credit Union will ensure everything is clear, transparent and straightforward. So, you can get on with creative and wonderful improvement ideas for your home, your way. Remember, that it is important to put in place a budget and know where your money is going before throwing your savings or borrowings at a project. If you are thinking about turning your house into a home again, Athlone Credit Union can help. Call in to them today or log on to www.athlonecreditunion.ie and try the loan calculator. Amount - €15000; Rate - 6.95 percent; Repayments - €68.23; APR - 7.18 percent; Term - Five years; Cost of Credit - €2,767.09. For more information on The Home Renovation Incentive Scheme please go to www.revenue.ie All Loans Subject to Approval. T&Cs Apply. Rate available for loans between €15,000 and €50,000. Example figures may vary. WARNING: If you do not meet the repayments on your loan, your account will go into arrears. This may affect your credit rating which may limit your ability to access credit in the future. Athlone Credit Union Ltd is regulated by the Central Bank of Ireland.